The Suicide Squad battle the Wall in the latest issue. That refers to the presumed descendant of Janos Prohaska (Blackhawk), not to Amanda Waller, who has also been known by that monicker. I enjoyed the story, although I had a couple of problems with it. For one, the whole thing seems to just go by too quickly. I’ve been noticing that, and not just in this book. Stories have a lot of action, and great visuals, but little in the way of character development or forward movement of plot. So often they seem to end a few pages before it feels like they ought to. And while I did enjoy the dialogue, the mystery Flag feels over why his hand picked guy has turned on everyone, and most of the visuals, there was one element that just annoyed me. 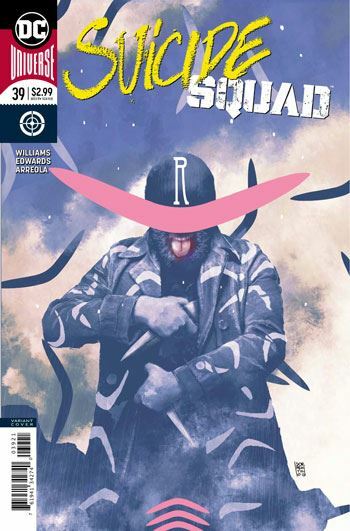 Without wanting to spoil anything, a member of the Squad dies in this issue. And I don’t believe it for a second. So far in this series we have seen Rick Flag, Captain Boomerang, and Hack all die, and all of them came back. The death in this issue, which looked great, held no impact for me at all, simply because I didn’t believe it. 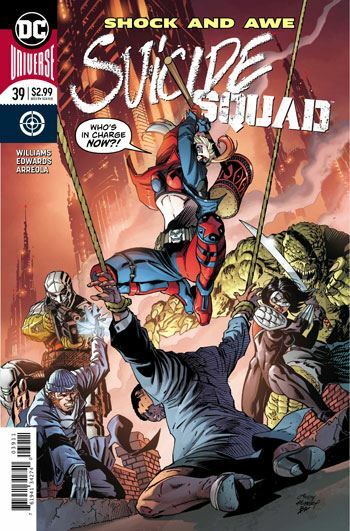 Perhaps I hold Ostrander’s Suicide Squad in too high esteem, but team members really did get killed off in that book. And the team’s line up changed periodically. It’s not that I mind any of the characters on this team. Williams has done a lot of good stuff with them. I really liked the romances he built between Rick Flag and Harley Quinn, and Croc and the Enchantress. But the line-up is virtually the same as in the first issue of the series. Needs more cannon fodder. I always seem to be complaining about this book. And yet I do enjoy it, and look forward to each issue. I guess it’s one of those cases in which something is very good, but could be better, and you just keep hoping for it to be perfect.